Synopsis: Why are humans and other mammals covered in hair, and why are there so many different types of it? Vivid photographs paired with a duo of quirky, illustrated hair guides serve to illuminate the fascinating facts about mammal hair: why it exists, what it's good for, and more. Readers will learn about different types of animal coats, such as fur and down, and explore the many different forms guard hairs take, such as the quills on a porcupine. About the Author: Winner of the National Council of Teachers of English Award for Excellence in Poetry, 2015, Marilyn Singer has written more than 100 books in many genres. An animal lover, Marilyn likes to look for critters in many places--and then write about them. She lives in Brooklyn, NY, and Washington, CT, with her husband, a dog, a cat, and two doves. Visit her web site: www.marilynsinger.net. My Review: No matter if you are just starting out with reading or reading on your own. If you love hair than this is the book for you!! 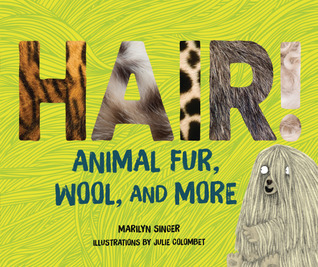 This is a cute little book to learn about why, what, and how hair is what it is. Kids will learn new terms (they are in bold) and have fun learning all about hair!! We had a fun time with this one on our weekly hair Saturdays. Go Into This One Knowing: Hair, Hair, Hair!